The latest build is ready for service! I need to get into the habit of posting stuff. Recent events around the home have conspired to make me completely forget about the blog. A big distraction has been the garden while a smaller distraction has been this Nickel Plate Road mill gondola. The prototype for the model. Joe Collias photograph from the collection of Frank Hodina. 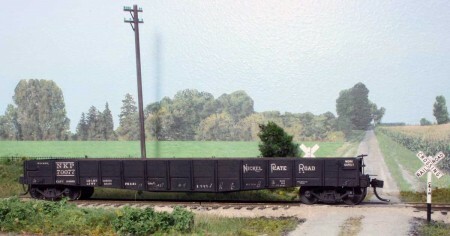 I wanted something to build that wouldn’t take more than an evening and had this HO scale Chad Boas kit among the stash. This is a very nice, very simple kit composed of a resin underframe and sides, resin side braces, and laser cut wood deck and sides. The Nickel Plate installed 500 of these gondolas in 1923 from the Standard Steel Car Company in the 70000-70499 series. These were the first 48-foot long mill gondolas on the Nickel Plate. Many were converted to all steel cars in the late 1940s. I replaced the resin ends with plastic ends from the extra parts bin to get a thinner part. As this is an operating model where the brake gear can’t be seen, I did not install any brake system. much of the underframe space was packed with weight. The fish belly side sills would obscure any view of the brake system, so why not fill the area with weight? The model was ready to paint in about an hour! I don’t believe I have ever built a resin car that fast. I think it took maybe ten minutes to paint. The most time was spent waiting for the Scalecoat l paint to dry. The decals are scraps from used NKP sets and the weathering was done with Pan Pastels. This gondola build was so much fun I think I’ll get a couple of Chad’s flat car kits! Check out his current model list.